These poems both assert and interrogate some aspects of dissenter patrimony and sensibility...a note seldom if ever heard in writing coming from the Republic of Ireland. The note is seldom overt but more often remains a ghost presence within or on the margins of contexts of love and domesticity. The sensibility which informs the poems is aware of the aridity of ‘ a hard intractable ground’ and is drawn to celebration and tenderness, but remains instinctively watchful and seeks to put these conflicting responses into a true balance. ... Denniston is a rare animal – a Southern Irish poet writing from the Protestant tradition. He makes good use of his Protestant hinterland...to write with imagination, sympathy and love. Denniston’s maturity and experience as a walker add a meditative quality and there’s a spaciousness and overall lightness to this collection, the feeling that all that walking has helped him to dispel his ghosts. These poems work their way up and down the scale of things, testing for size, for depth, for music. Walking a landscape is a favoured method of approach…always the poet seeks to find his own way forward. Originally from Longford town Edward Denniston has lived and worked in Waterford since 1980, the city in which his Presbyterian ancestor from near Moatfarrell Longford travelled to live and preach dissent in the early 18th century. Edward is a retired teacher of English and Drama. 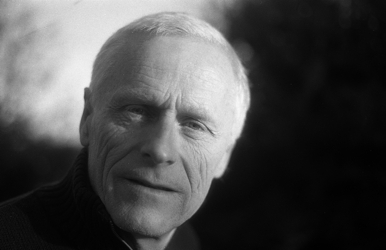 His publications are: The Point Of Singing (Abbey Press, 1999); Eskimo Advice, an ebook (Rectory Press & Hayrake Press, 2007); Interacting – 60 Drama Scripts (Russell House Publishing, 2007) and The Scale Of Things (Salmon Poetry, 2013). 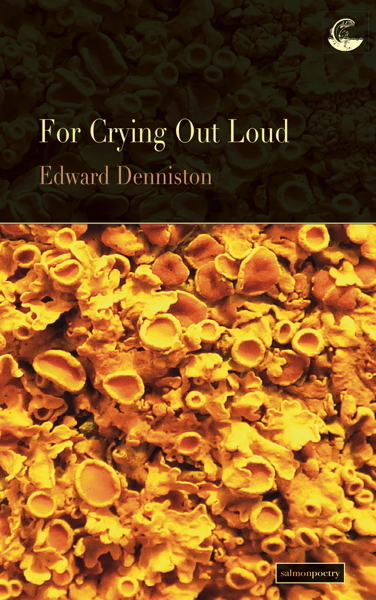 The poet Edward Denniston on his bicycle popped up from behind a pole and handed me his new collection For Crying Out Loud (great title). " I wanted you to have this". No admonishment that I hadn't attended the launch. He didn't ask me to review it. In the poem 'Kingfisher' there is the line "the shiftiness of shadow and light". Thomas McCarthy says that Denniston has"spent his creative career searching for the perfect kingfisher of elusive poetry, knowing that poems are as shy and rare as the private life of the riverbank". I start to tell him about the other books in the small pile, problems about space and so much going on. With a wave he is gone and I thought "For crying out loud". Edward Denniston's poems are of the landscape "need to name the grasses, flowers, trees, birds living in the field behind his house". At times he is elusive - "to capture and frame the substance of things" or " knows more than imagined" or "a fleeting never again once off". Opening poem 'Beech Trees' surprises you: "That day we took off our clothes amongst the beech trees". Before that, there is the line "A small boy stole away on his bicycle". His poems hunker down in a ditch, sense the ' dreep of condensation', leave a trail like a slug or snail "your slow mucus ways". But embedded in this landscape of nature you will find the grief of dying, blood tests and their implications, the grave of Suzanne and Samuel Beckett (a journey I made after Jim Morrison and Oscar Wilde), Gerard Manley Hopkins on Bus Route 66. There is the simplicity or complexity of a poem called, 'Nothing' that depends on how you read it. I tried it backwards "naught from its own deriving as it does empty or full having it troubles us" (Yoda poetry?). In a poem 'Chair' I find the line "or the knowhow of time passing" and I know I have been in the presence of a poet who has the 'knowhow' and the next poem is 'After All This Time'. Now would be a good time to buy For Crying Out Loud (published by Salmon Poetry).